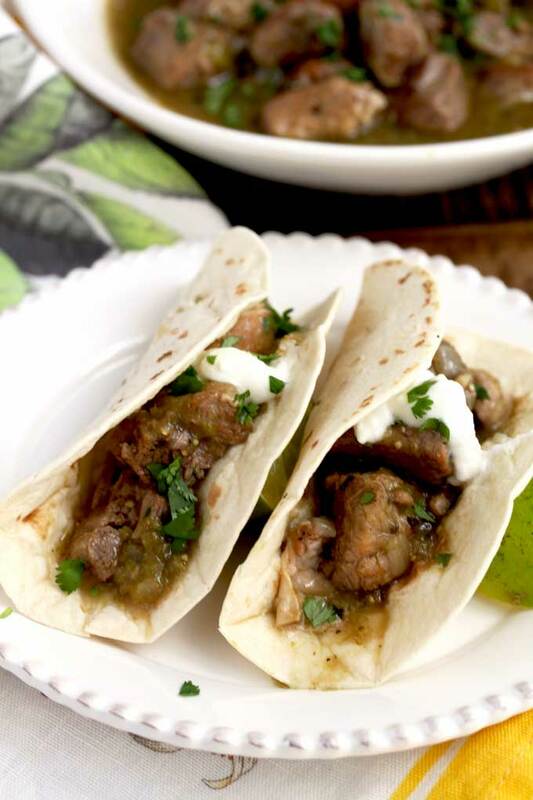 This Pork Chile Verde features tender pieces of pork simmered in a flavorful tomatillo sauce. This delicious chile verde recipe is tasty, a bit spicy and made easy thanks to a few shortcuts! This is one of our favorite pork stews! We make it at home all the time because it is simple, comforting, hearty and packed with Mexican flavors! Besides, who wouldn’t want super tender, amazingly delicious, juicy pork pieces that have been simmered for hours in the most flavorful sauce. Serve it with some warm flour tortillas, over rice, or make it into a taco or burrito and you’ll feel like you are in food heaven! 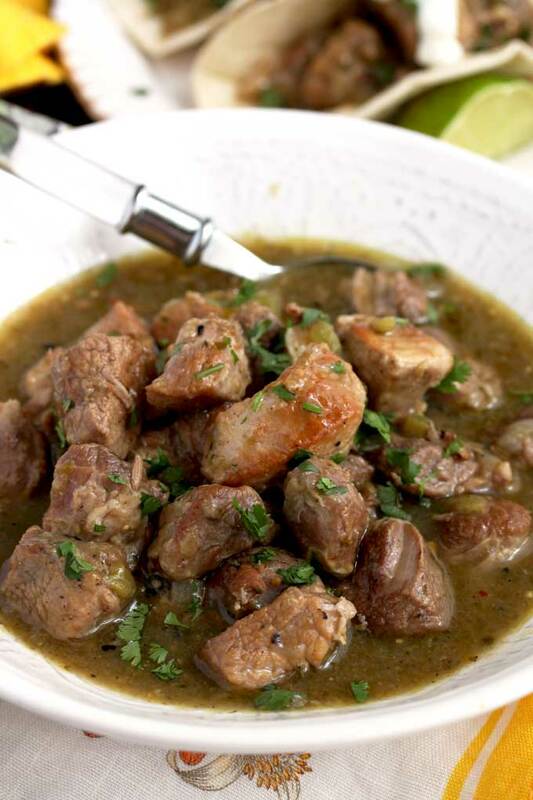 By using a few shortcuts, this chile verde recipe is a cinch to make. 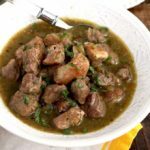 Instead of oven roasting tomatillos and other vegetables, I use a combination of canned tomatillos, chiles and sauces that really cuts the prep time and results in a pork green chile stew you can easily make any day of the week! 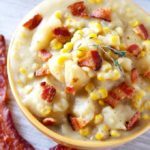 Easy slow cooker recipes are some of my favorite! There’s nothing better than coming home to a wonderful meal made effortlessly in the crock pot! 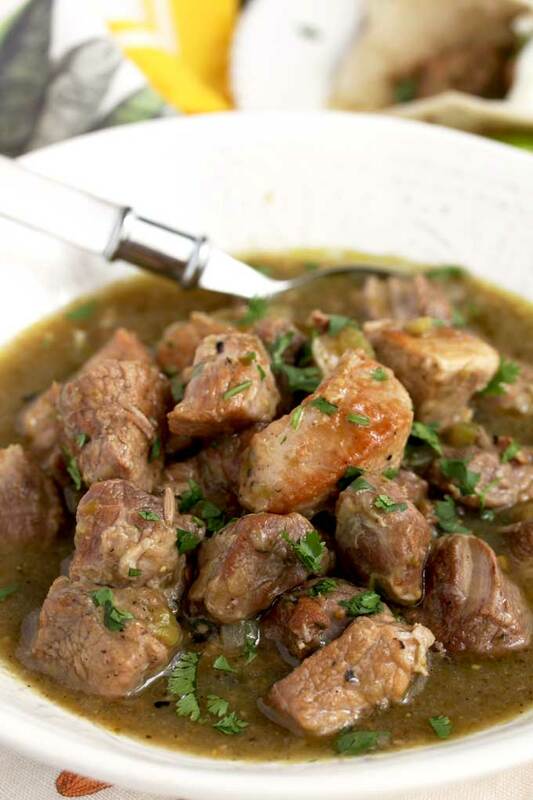 For this slow cooker chile verde, I like to brown the pork before adding it to the slow cooker. The flavors developed by searing the pork are totally worth it! Season the pork with salt, pepper and ground cumin. Sear the pork pieces in a skillet until golden brown. Remove the pork from the skillet and place the meat in the crock pot. In a food processor, blend the canned tomatillos until smooth. Add the tomatillos, onion, garlic, salsa verde, green enchilada sauce, diced green chiles, oregano, cumin and liquid smoke into the slow cooker. Cook on low for 6 hours, or on high for 4 hours. One hour before the cooking is done, mix the cornstarch with water or broth and stir it into the hot stew. Cook for an additional hour and serve!! You can use any store bought jared or canned tomatillo salsa. When buying tomatillo salsa, enchilada sauce and chopped chiles, check the heat level. If you don’t like spicy foods make sure you buy the mild varieties. 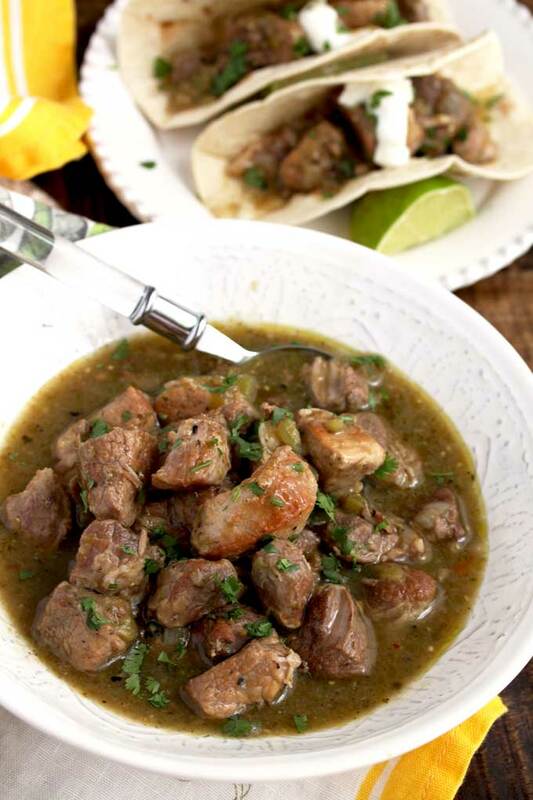 WANT TO MAKE THIS SLOW COOKER CHILE VERDE? PIN IT TO YOUR DINNER OR CROCK POT BOARD TO MAKE IT LATER!! Season the pork with salt, pepper and 1/2 teaspoon of cumin. In a large skillet, heat 1 tablespoon of oil over medium - high heat. Working in batches (to not overcrowd the skillet), add the pork to the skillet and cook until golden brown. Add additional oil, if needed. Transfer the seared pork to the slow cooker. Add the tomatillos to a food processor and blend until smooth. Transfer the tomatillos to the slow cooker. Add the onions, garlic, salsa verde, green enchilada sauce, diced green chiles, oregano, cumin and liquid smoke to the crockpot. Mix to combine. Cook on low for 6 hours or on high for 4 hours. About an hour before serving, mix 3 tablespoons of cornstarch with 1/4 cup of water or chicken broth. Stir in the cornstarch mixture and cook for an additional hour. Adjust seasoning to taste and serve! Holy cow does this slow cooker pork look delicious! Your photos are outstanding and truly. make me want to have a bite of my monitor!!! I love the sear on the meat … I love sloe cooker foods but sometimes I really miss the texture and caramezlition of the meats in it. This is a great idea to have the best of both worlds! Thank you! I agree with you. I love searing the meat first in most cases. I love the flavor combinations, sounds delicious! This is going on our menu this week and I can already smell that delicious cumin and pork together! It’s nice to have some shortcuts to a dish that usually takes a lot of prep time! Oh wow!!! That pork looks INSANELY good!!! 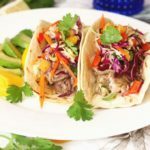 So much flavor and I am definitely always looking for new slow cooker recipes! Cant wait to make this one! I love making chili and this seems like a lighter version that will go great when it finally cools off here in AZ! Plus I have so much pork in the freezer! Way more than beef right now! I love slow cooker recipes. 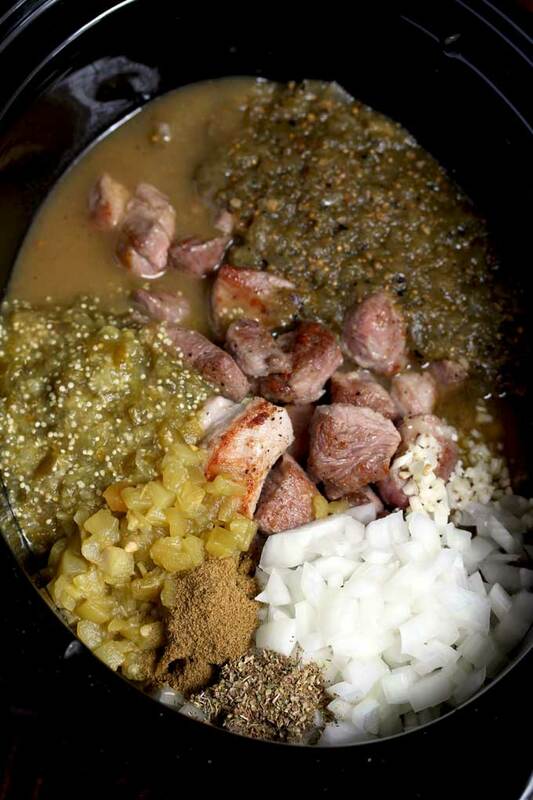 Why have I never made pork chile verde?? I know my family is going to go bonkers over this one! My family does too! Thank you! I am drooling just looking at your pictures! Chili Verde is so savory and delicious, thank you for a wonderful recipe!! I just made this tonight! It is soooo delicious. I didn’t have cornstarch and didn’t want to use flour so my mother always thickened her broths or salsas with crackers. I did that and worked well. Thanks for this recipe. Will def make again! !